Shivahari Sellamuttu was cooked for with love and in turn, she cooked with love for her children. In the book she released late last year, she shares her love for cooking, spiced with memories of the people who started her off on what for her was a very integral journey. In ‘Before it’s all forgotten’- a collection of Sri Lankan recipes encompassing tradition and creativity- we discover Northern cuisine with a smattering of Southern and South Indian as well. The recipes may be the meat of the book but for her readers there is the rich vein of the deep feelings she shares for the people and the country she grew up in. It was a large extended family, not just with her parents and siblings but also grandparents that she recalls– how as a little girl her mother would tell her about her own grandmother who made wonderfully authentic curries. Shivahari had a sixth sense that one day she would have this same passion for food and be as creative a cook as her great grandmother. “These recipes I share with you here represent the stories of so many experiences of my life,” she writes. And if her childhood growing up in her grandparents’ home St Edwin’s in Cinnamon Gardens and going to boarding school in Jaffna- Vembadi seems to have been quite idyllic, it was no cakewalk when she moved to Australia in the early ‘70s and went on to launch her own restaurant ‘Shivahari’s’ in Melbourne, dishing out the delicacies she had learnt to make from grandmothers, mother, aunts and helpers along the way, and those she had created for her own three children. Shivahari had to prove herself as a chef and her years working in several Sydney restaurants such as ‘Radio Cairo’, ‘The Sri Lankan Room’, ‘The Curry Connection’, ‘Botanical Gardens’ and ‘Maharajah’s’ amply testify to her credentials. An unfortunate injury to her knees forced her to give up her career, which though led to her decision to compile this book. On to the recipes themselves. However good the presentation, it is the recipes that must stand out in a cookery book and Shivahari’s may be one of those that end up, much thumbed and curry-spattered in the kitchen. Well organised into several sections from starters, breads and rice, to spices, mixes and curry pastes, pickles, sambals and chutneys, eggs and vegetable dishes, fish and shellfish, meat and poultry etc, the recipes, all illustrated, are precise, some with added notes and tips. 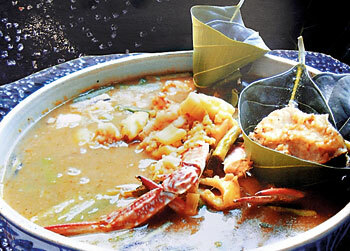 Familiar favourites mingle with newer dishes, Masala vada, prawn cutlets and signature Jaffna ones like the ubiquitous Kool soup one would of course expect in a book on Northern cuisine. Except here it is Annapillai’s Kool Soup. Annapillai was her maternal grandfather’s caretaker’s wife and Shivahari paints with genuine affection, the portrait of the woman who drew water from the well for the children to have refreshing baths in the heat of the muggy Jaffna morning and enlightened her about the different spices that she ground into golf ball type sizes for everyday cooking. Annapillai’s Kool was no hasty affair – planned days ahead, it required the freshest of seafood and was a Sunday afternoon special for the family served in a huge clay pot placed on a coaster made of dried palmyrah leaves. The soup spoons were an interesting touch- leaves of the jakfruit pinned together. Shivahari takes special delight in bringing forward the people who so generously gifted her with their knowledge and expertise�her mother, grandmothers, and many aunties. And so we meet Aunty Rajes with whom Shivahari lived for a while before she migrated and who taught about the ‘Sarakku curries’ made of ancient recipes which had special healing properties. In the home of another aunt, Aunty Nahes who was known for her special Turmeric Crusted Egg Curry, there was her helper Caroline who had her moments with Aunty Rajes’s numerous instructions delivered in less than perfect Sinhala, right down to the very precise way in which the boiled eggs had to be pricked with the stem of a karapincha – ‘hondata’. The story ends with Caroline being instructed to fry the pricked egg ‘hondata’ till it became like a pappadam at which point the hard pressed Caroline retorts “if you want a pappadam, why don’t you eat a pappadam,” with Shivahari unable to control her laughter. This is then the beauty of this book, not just the recipes but its warmth and the flavour that literally assails you, of spices yes, but also of relationships, savoured and cherished. We get to know the family Shivahari loved, her influences, her own preferences as a cook and the distilled wisdom handed down over generations. In the desserts section, her first love, she confesses, side by side with the traditional dishes like payasam, she intersperses her children’s favourites, like the Chocolate Gateau and Chocolate Mousse of which today, she says her little grandson Denzel is an absolute connoisseur. Daintily designed, the cover painting by Andrew Neill captures that whiff of nostalgia Shivahari evokes with a painting of a Northern landscape. The design element is visible in the motifs decorating each page. A few lapses in misspelt words should have been spotted but hopefully would be rectified in future editions. Generations of recipes shared, stories told and memories recalled – Shivahari Sellamuttu has opened her heart and produced a book that speaks to its reader, whether cook or otherwise.